Most of my Service Bus solutions were created from the classic (old) Azure portal. You could previously combine queues, topics, relays and event hubs as you desired in the same namespace. Apparently I had missed some communication regarding the service bus in the “new” portal (how long can we call it that?) and my WCF Relays and Event Hubs can not be found in the new portal but are still visible in the old one. As the service bus interface will be discontinued in the old portal from September-15-2017 I think it may be the right time to discuss on how to continue working with the Service Bus in the new portal. 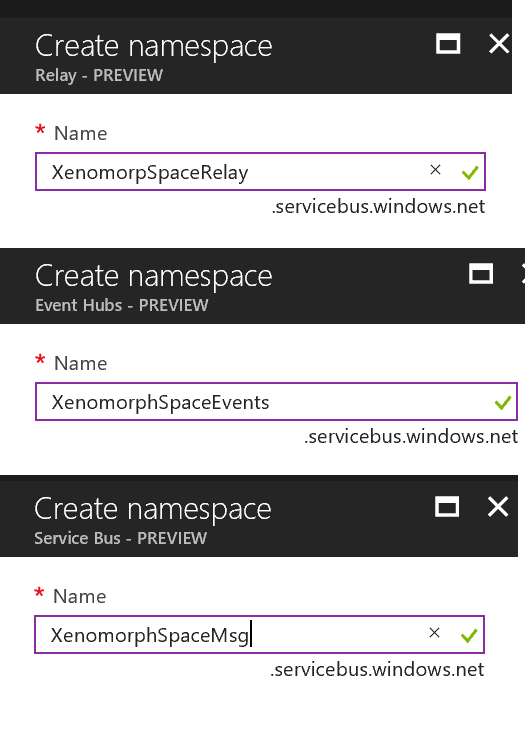 If you open the Service Bus namespace in the old (classic) portal you can see that the same namespace can hold all of the previously mentioned types in the same namespace. In my case I had this old service bus with both relays and queues (in another service bus I have the same problem with a combined queues/topics and Event Hub Service Bus namespace). My relay is not visible among the entities so I cannot access it in the new portal. It will only display the Queues and Topics. What is worse is that the old portal will not support service bus from 2017-09-15. The same goes for my other example, I cannot see my Event Hub – just my queues. If I try to add an Event Hub to the old namespace it will prevent me from doing that so Microsoft did at one point or another prevent you from setting up combined namespaces in the old portal too (although I did not notice it). I and likely some of you will still have older combined service bus namespaces that will be affected by this. So how does it look in the “new” portal? 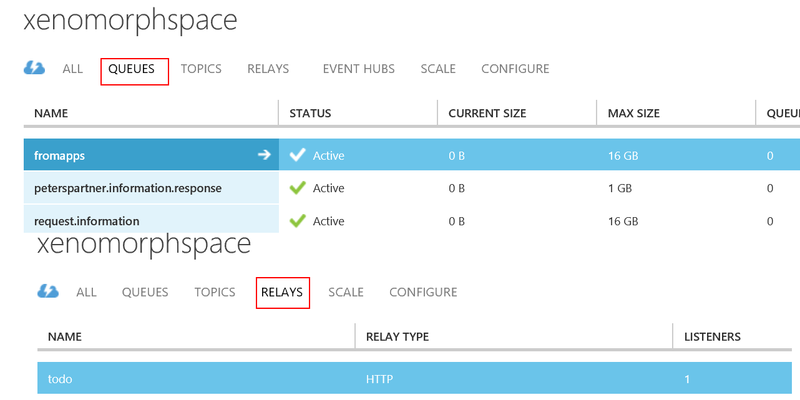 When you create new instances you should now enter Relay for WCF Relays and Event Hubs for Event Hubs. The old Service Bus name is now reserved for queues and topics. If you look carefully when creating the individual types you will see that they will still create a service bus namespace (.servicebus.windows.net). If you consider the economical aspect you will now need more service bus namespaces for the same functionality. But only topic and queues are charged by a monthly fee and Event Hubs and Relays are charged only by usage so you will likely pay the same amount even though you split them. For those of you just playing around with a MSDN professional subscription Azure credits may consider using the basic pricing version to reduce the cost for the queues / topics and use a Basic Event Hub to conserve your precious credits. It is not more difficult to work in the new portal then the classic (old) one. Each type of service bus will display the actual entities that are relevant for the type of service bus that you are working with. I recommend that you to through your subscriptions and try to locate any combined service bus instances as soon as possible as I don’t know what the cease in support for service bus in the old portal will actually mean in terms of maintaining your Event Hubs and Relays after 2017-September-15. Specialize your service bus instances between queues + topics / relays / event hubs. I am convinced that your old combined namespace will continue to work after September 15th but you may have difficulty maintaining them unless you split them. This also continues the trend that the combined component services from Microsoft are being split into separate components. It happened to Azure storage some time ago – now you probably want to use Blob Storage for block blobs. This time it is Service Bus. These specializations allows for optimization of each component and hopefully better performance/stability/prices for us consumers.